Missing fingers, Christmas, a Hispanic Scott Baio—director Shane Black proves that imitation is the sincerest form of self-flattery. Yesterday was a big day for semi-sequels to Marvel’s The Avengers, featuring the TV debut of Agents of SHIELD and the DVD release of Iron Man 3. When the latter was released in theaters, a lot was made of its Avengers references—the repeated invocations of what happened in New York, the line about when “the guy with the hammer fell from the sky,” etc. But watching the movie a second time, I was struck by how often it went out of its way to pay homage to another precursor: director Shane Black’s 2005 film, Kiss Kiss Bang Bang. A quick recap: From the mid-'80s through the mid-'90s, Black was synonymous with Hollywood excess. His screenplays (Lethal Weapon, The Last Boy Scout, etc.) sold for small fortunes and took the cinematic art of blowing things up to its inevitable extremes. But after The Long Kiss Goodnight was a relative flop at the box office, Black essentially took a decade off before returning with Kiss Kiss Bang Bang, a cunning satire of the hard-boiled detective genre starring Robert Downey Jr. The movie didn’t make much money, but it was a cult hit. More important, it was a crucial step in the comeback of Downey, who’d only recently finished a stint in prison on drug charges. 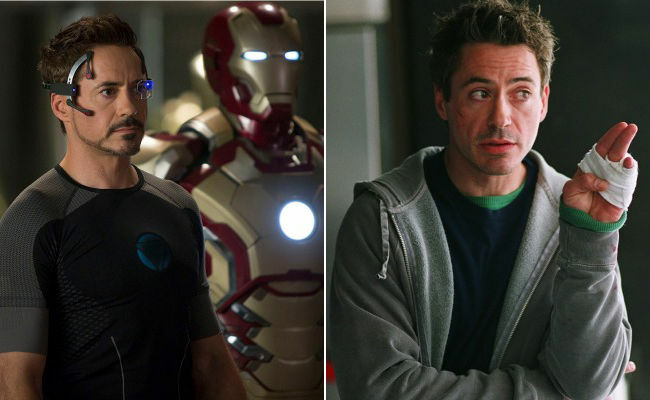 A few years later, Downey returned the favor, helping Black—who’d actually done some uncredited consulting on the first Iron Man—get the gig directing Iron Man 3. 2) Christmas. The holiday is a staple of Shane Black films: Lethal Weapon, The Last Boy Scout, and The Long Kiss Goodnight were also all set at Yuletide. Black claims that he initially resisted the idea with Iron Man 3 but was ultimately persuaded by co-writer Drew Pearce. 3) The missing finger. In Kiss Kiss Bang Bang, Downey’s character loses a finger when Michelle Monaghan slams a door on him. In Iron Man 3, Tony Stark’s young accomplice, Harley, breaks a finger off his armor. It’s a little hard to tell, but it looks as though in both cases it’s the ring finger of the left hand. 5) Abandoned at the car. In Iron Man 3, Stark drives off, leaving a forlorn Harley in the street, following one of the funnier exchanges of the movie. Harley: “So now you’re just going to leave me here … like my dad?” Stark: “Yep.” In Kiss Kiss Bang Bang, it’s Downey who’s abandoned at a low ebb by Val Kilmer, who has to physically lean him up off the car in order to drive away. 7) Demolishing the fourth wall. In the epilogue to Kiss Kiss Bang Bang, Downey (and Kilmer) dispense with all pretense and address the audience directly. In the post-credits sequence in Iron Man 3, it’s revealed that Stark’s true audience is not us, but a dozing Bruce Banner. 8) Protocop. I mean, seriously. How obvious could it have been that Shane Black was destined for Iron Man?